A combination of two great Heritages of the Humanity: Cultural y Natural. Machu Picchu and the Manu National Reserve. 06:00am Meeting. 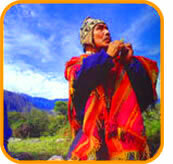 Transfer to the Ima International Airport “Jorge Chavez” to take the flight to Cusco city. Airport tax included. Breakfast onboard. Arrival and reception in the airport “Velazco Astete” and transfer to the hotel. Afternoon. City tour. Visit to the Templke of the Sun, Korikancha, The Cathedral and the 4 archeological spots: Saqsaywaman, Kenko, Pukapucara and Tampumachay. Lodging in Cusco. Korikancha was a store of GOLD. It was built afte the spanish conquest. The dominicans built it on the prehispanic aarchitectonic basement. base arquitectónica prehispánica. So, we can see both syles in that construction, the spanish and the Inka one. 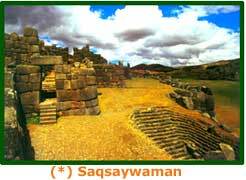 Saqsaywaman. According to last studies, more than a Fortress it was a Ceremonial Center. 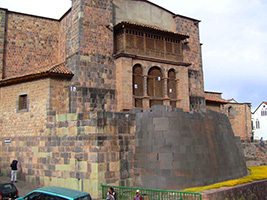 It was built between the XV y XVI centuries during the Inka government of Pachacuti, Tupac Yupanki and Huayna Capac. The outside walls have a height up to 9 meters with a weight of 350 tons. Kenko is a quechwa (peruvian language) word that mans "laberynth". We don't know certainly what it was. Maybe the name was given due to the semi-circular construction. 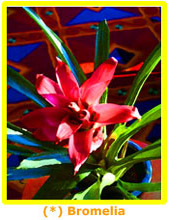 Several theories state that it was an altar, a court, an inka tomb, etc. But it is asumed that it was one of the most important sanctuaries of the Inkas. 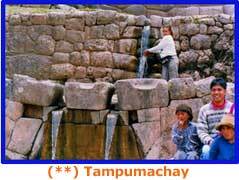 Tampumachay comes from two kechwa words: "tampu" lodging y "machay" place of rest. The theories state that for the waterfall, it could have been like a place for the Water Worship. It is well appreciated for the stones architecture shown in 4 tearraces in different levels. Very early, departure from Cuzco city in one ofour vehicles specially prepared por the route.We will go through andean valleys and picturesque towns, vsiting the pre-inka thombs "Chullpas" of Ninamarca. 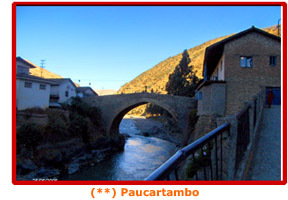 At noon, we will pass by Paucartambo, typical colonial town, which still keep its original style. 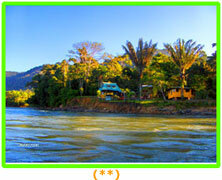 Continuing the trip we will rise up to the Acjanacu abra de Acjanacu cove at 3,850 m.s.n.m. From here we star the decending going through the Clouds Rainforest, very rich zone in endemic species like the Bear of Glasses, ferns, bromelias and orchids. Wewill overnight in “San Pedro” Lodge. 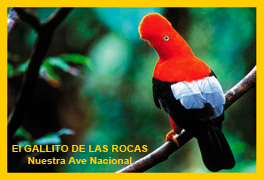 Very early we could apreciate the Flirting Dance of the "Gallito de las Rocas", the national bird of Peru, who has an intense red-orange plum. 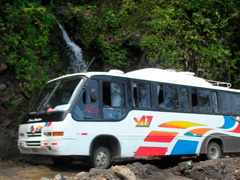 We will be on a Observation Plataform called "Lek"
After brekfast we will contoinue in our bus, crossing the high jungle, arriving to Pilcopata, then we decende to the port of Atalaya (600 meters of altitude), placed in the shore of Alto Madre de Dios river, place whre we board a motor boat, which is equiped with all the necessary stuffs for the trip. We could observe some birds like herons, vultures, cormorants, etc. We will arrive to the Erika Lodge. We will overnight ther for one night. 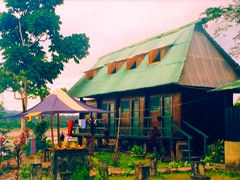 Erika Lodge is located on a transitional zone between the high jungle and the low jungle (600 - 1,550 meters of altitude). The different altitudes justify different habitats, explaining like this the veriety of wild life. We will walk through their interesting roads, where the guide will talk us about the mammals, birds, reptils, insects, medicin. 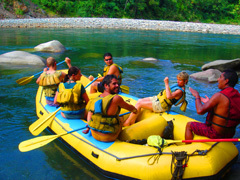 CANOYING (*): From Pilcopata town, we will make about 2 hours of canoying (Class II and III) through the tropical Pilcopata river, passing by the spectacular "PONGO" of Koñeq A PONGO is a narrow and dangerous pass of a river. We will enjoy the view and crystal water bath. Continue until arrive to the Private Reserve "Erika". 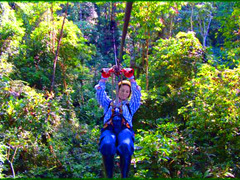 CANOPY TOUR (**): The guests of Erika Lodge have the chance to make the exciting activitiy of passing from tree to tree at high speed thorugh very well built equipment. Trained people will assist you during all the experience. 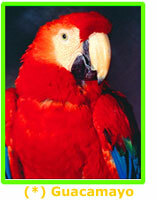 Very early we will go to a Collpa of Parrots, a clayey wall of the river where a lot of parrots like th eone of blue head, the one with white eyes or the Macaws go there every morning to lick pieces of clay which contain all the necesary minerals for their daily balanced diet. The Breakfast will be after this activity. Then, we will star a shor trekkin. After lunch, we will continue in theboat to the Atalaya Port, previuos stop in a small lagoon to see caymans and hoatzins. Then, we'll take the bus to go to the Sacred Valley of the Inkas. 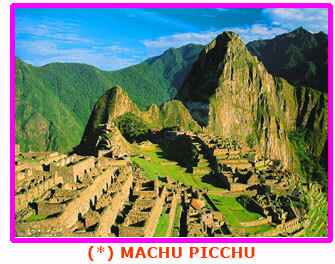 Click here to see more pictures of Machu Picchu. On 2007 Machu Picchu was declared one of the 7 wonders of the new world. FULL DAY EXCURSION to MACHU PICCHU. 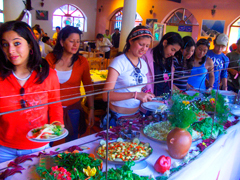 Lunch in a typical touristic restaurant in Aguas Calientes. Visit to the Town. 05:30 Continental Breakfast. 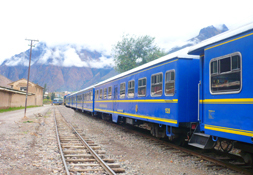 Transfer to the station to take the train to Aguas Calientes town, right below of Machu Picchu. (BackPacker service). Full Day excursion. MACHU PICCHU was shown to the World in 1911 by Hiram Bingham, but the name of Machu Picchu was given by Melchor Arteaga, the guide of Bingham. For some scientifics, it was a monastery to educate women. For others, it was like a mausoleum to keep the Inka mummy. These are just two among many hypothesis about he function of this citu. In general, this sanctuary (3rd. hypothesis) was divided in 2 sector: Agricultural and Urban. It contains temples, palaces, houses, stores and overall buildings which accomplished religious ceremonial functions. 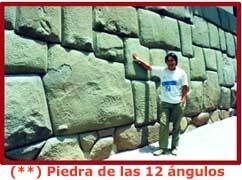 One of the misteries is the construction in stone. The union between them without cement or any kind of glue. Las squares, aqueducts, the vigilance tower, the solar clock, among other vestiges, is a big testimonial of the high tecnology of the Inkas. 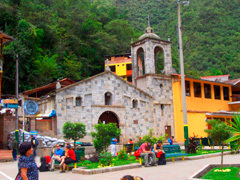 After this exciting visit, we will go down to Aguas Calientes town to have LUNCH on a touristic restaurant. Visit to the town and return to Cuzco city. 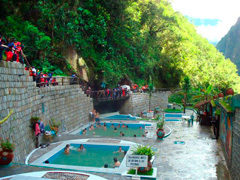 OVERNIGHT in Aguas Caliente. Dinner. Disco Night with drink included. 08:00 Continental Breakfast. Transfer to the train station. 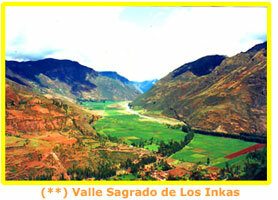 Excursion to the Inkas Sacred Valley. 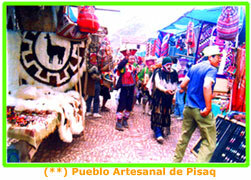 Visit to the handicrafter town of PISAQ, where you can buy handicrafts, then Calca, Urubamba. 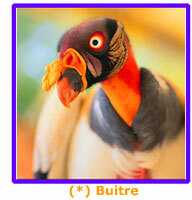 Buffette Lunch. THE HANDICRAFTER TOWN OFPISAQ is well appreciated for its colonial church and the traditional Sunday Fair. The Sunday Marketplace gather many handworkers to offer their handicrafts in clothes, pans, vessels, Pucara Bulls and silver jewerly. 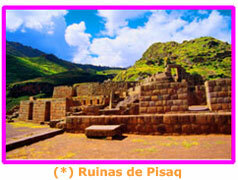 NOTE: The visit to the Pisaq Ruins requires longer time. Buffete Lunch. Visit to the Ollantaytampu Fortress. Return to Cuzco. 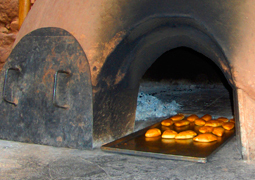 (**) Fotos del Horno de Pisaq y el Buffette de Urubamba. 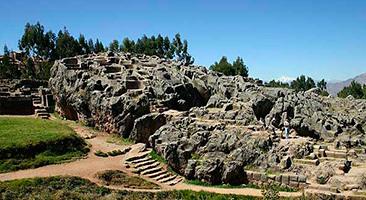 Ollantaytambo was a strategic militar, religious and agricultural center. The originalk style of the buildings make it different. It is said that it was a militar fort to protect the Inka Empire. 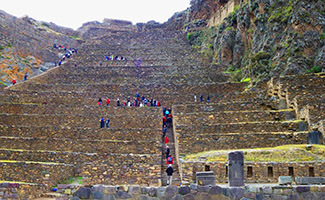 Ollantaytambo stayed on the population memory thanks to the Theatral Piece "Ollantay" which is represented since the times of the Inka Pachakuti. The Play talk about an impossible love between the General Ollantay and Cusi Coyllur, the daughter of the Inka Pachakuti. They can not hold a romance for belonging to a different social classes. Breakfast. 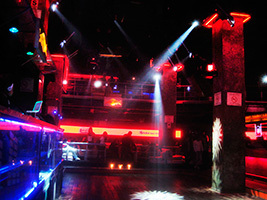 At a certain time, transfer to the airport to take the flight to Lima. Airport tax included. Lunch onboard. Arrival to the INternational Lima Airpoirt "Jorge Chavez".